See our blog below with a full description of this video along with opening hours, how to buy tickets, contact info and more! Below are also other videos you might like! Hey guys, Sean here from The Roman Guy. We’re here in Roma Termini station, it’s 6:05 AM and we have the 6:15 AM train for a Rome to Venice day trip. We generally suggest you spend at least one night in Venice, but not every vacation has time for that. 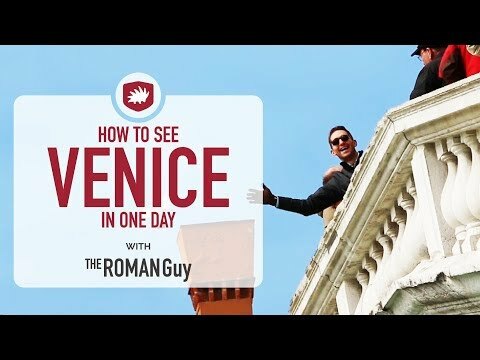 We understand so we’re going to show you how to see Venice in a day. Venice is made up from 118 island and is home to over a quarter million people. The historical center itself and what we call the main island, is home to just around 55,000 residents. With an average of over 30 million visitors per year, it’s a great idea to plan your day well. Venice is about 15 times smaller than Rome, and all the top things to do are within walking distance from one another. Venice is in the Veneto region of Italy, on the Adriatic Sea. By train it’s about 3.5 hours from Rome, 2 hours from Florence and 2.5 hours from Milan. Don’t get off at Venice Mestre, Venice S. Lucia is your stop! From Venice Santa Lucia train station you can either take an expensive water taxi which is really cool, or the vaporetto which is like a boat version of a bus. You can take number 2 which will take you straight to St Mark's Square. You can buy your tickets right outside the train station, and a single journey will cost you 7.50 euros as of 2018. Remember to validate the ticket before you get on board. The ticket is good for 75 minutes after you validate it and you can hop on and hop off as you go. The trip to St Mark's Square takes about 30 minutes. St Mark’s Square is one of the most important and most recognizable squares in all of Italy. If you’re planning on going inside St Mark’s Basilica, you can either buy tickets online or book a guided tour to skip the line. Don’t show up without a ticket, or you’ll spend your day in Venice waiting in line. Remember that entering St Mark’s Basilica, you’ll be entering a holy place, so make sure you have your shoulders and knees covered. On the right hand side of St Mark's Basilica, you’ll find the Doge’s Palace. The special itinerary tour takes you to the once famous cell of Casanova and you also get to go across the Bridge of Sighs which is super cool! You can visit the Doge’s Palace every day from 8:30am to 7pm April through October or until 5:30pm November to March. This clock has been keeping time in Venice for over 500 years and built in the late 15th century. Venetian legends hold that when the clock was revealed, it was so beautiful that the Doge had the clockmaker blinded so he could never create anything to rival it. If you’re a lover of great views, definitely check out the Campanile or Bell Tower, open only April through to October. Most people just think it’s the Libreria Acqua Alta is just a quirky store with gondolas inside but there’s actually a method to the madness. The name translates to the Library of High Water, most books are protected in bathtubs or even a gondola. This is because the canals flood and it’s the best way to keep the books protected. The Rialto Bridge is one of the most recognized attractions in Europe, let alone Venice. It was actually first built as a pontoon bridge in the 12th century. Later they rebuilt it out of wood but it burnt down a few times and collapsed on even more occasions. Finally they completed what you see today in 1591. Nino & Friends is a cool little shop that we happened to stumble upon, they had the best cookie I’ve ever eaten in my life. This city is a fishing village, so definitely walk through the fish market, which is a great picture of the local culture. The Jewish Ghetto in Venice is the oldest Jewish ghetto in the world. It was created here in 1516. In the Jewish Ghetto neighborhood you can find many cicchetteria and restaurants such as Mezzopieno, Bacaro dai Morosi and Birreria Zanon. At this point, check your watch, see what time it is and start making your way back to the train station.